Why does Italian manufacturer TM build such tall motorcycles when Italians are stereotypically short in stature? Every TM bike we have tested is tall—at least taller than its competition. The general U.S. population has gotten accustomed to Japanese-built motorcycles over the years. With the U.S. male averaging 5 feet, 9 inches, and Japanese men averaging 5 feet, 7 inches, did the “Big Four” Japanese manufacturers build bikes too big for their own population? Or, did the average 5-foot-9 American get used to the small size? Are Italians really shorter? Compared to other Europeans, yes. European men average 5 feet, 10 inches, and in most countries, 5 feet, 11 inches, whereas the average Italian is 5-foot-9. So, this makes one wonder, which market did TM build its bikes for? The taller European market, or is the TM the perfect height for an Italian, which should be the perfect size for an American? This is the TM MX300 that MXA test rider Johnny Jelderda raced to fifth at the 2017 MTA World Two-Stroke Championship. It is the most exotic TM on the planet. Maybe KTM’s history can help us figure this out. The average Austrian male is 5-foot-11. Through the years the American consensus was that KTMs just didn’t feel right. Most wanted them to feel more like a Japanese-made bike. And, that was KTM’s goal—to make its KTMs feel like Japanese bikes, because that was what the American market wanted. They did just that, eventually surpassing the popularity of all the Japanese brands. What are we getting at? After all the TMs we have tested throughout the years, we realized we wanted the bike to adjust to us, not the other way around. We were always changing the bars, seat height, shock length, fork height, springs (front and rear) and, in general, rebuilding all the ergo that came from the Pesari, Italy, factory. Bottom line: we wanted it to feel like a Japanese-made bike, because that is what we are accustomed to and have grown to like. TM is known for their high-horsepower two-strokes. This 2017 TM MX300 engine lived up to the TM name. It had a 250cc powerband with 300cc power. The addition of a Pro Circuit pipe and VHM cylinder head made this bike race-ready. Note the “USA Edition” engraved on the ignition cover. Ralf Schmidt, who is the American TM importer, has learned to change his ways since he moved to the USA. He is from Holland, where the men have an average height of 6 feet. The first TMs he brought from Italy for the MXA wrecking crew test had super-tall bars, mellow powerbands, stinkbug attitudes and rigid suspension. We felt really uncomfortable with the Euro setup, and Ralf was dumbfounded that we didn’t like what he and the European crowd preferred. Now that Ralf has been in America for awhile and raced on American tracks, he has grown to understand the American ways and adapted to what the USA racers want. So, to satisfy MXA, he built us a 2017 TM MX300 two-stroke that didn’t feel like a TM, at least for the most part. It felt like what we have become accustomed to dimensionally—a Japanese bike. How? It didn’t take much at all. He first threw the old ape-hanger handlebars out the window and replaced them with Renthal 999 TwinWalls, which is the lowest bar bend Renthal makes. He put on an Ohlins TTX rear shock, which is a TM factory option, and that was sent out to GPM suspension, as were the rigid Kayaba forks, to get a plusher setup. The 13-tooth countershaft sprocket was switched out to a 14-tooth to broaden the power from gear to gear. TM distributor Ralf Schmidt offers the Ohlins TTX shock as an option when you buy a new TM. It just costs a bit more. The modifications to the engine were nothing more than bolt-on power. Why? Because a Pro Circuit pipe and VHM cylinder head were all that was needed to give the MX300 pony power we wanted. The powerband of this project TM 300MX was unlike most 300cc machines. On Glen Helen’s hills, the TM MX300 had a long powerband that kept on pulling. You didn’t have to short-shift due to a short sign-off as with most 300s. It felt like a 250cc two-stroke powerband with incredible power. The only thing Ralf didn’t have time for was cutting the subframe to bring the stinkbug rear end down. 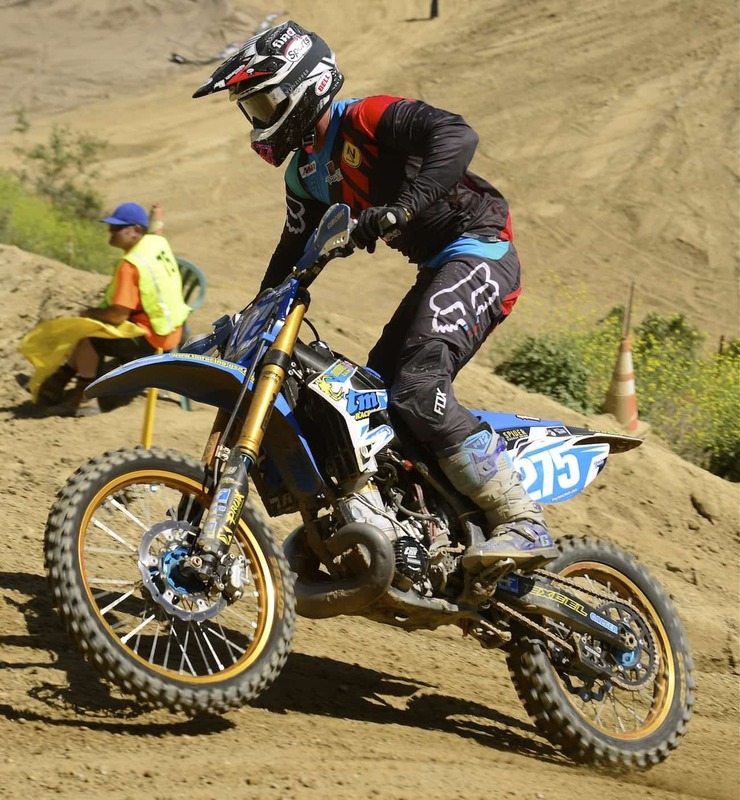 We were on a deadline because we wanted to have our ace MXA test rider, Johnny Jelderda, race it in the MTA World Two-Stroke Championship at Glen Helen. To compensate, we lowered the sag to over 115mm to balance out the front and rear. We felt more at home on this TM than on any previous TM we have tested thanks to the revised ergos and suspension. The low bars made the cockpit feel like a YZ250—not too big, not too small. It was comfortable. The forks were much better than we could have expected thanks to Phillip Maassen at GPM (in Germany). Who says aftermarket companies don’t build TM parts? As you can see this TM is littered with aftermarket parts. Many of the companies just do not list TM parts in their catalog due to the small quantities sold. But that doesn’t mean they don’t sell them. On past TM tests we would often think it was the chassis that caused problems with the handling, sort of like the days when KTM couldn’t get its WP components figured out. We thought it was the KTM chassis until we slapped Kayaba SSS forks on and all was cured. At best, the stock TM suspension components are mediocre. The GPM forks, which were stock TM-version Kayaba SSS forks that were re-valved and had a reduced friction coating on the tubes, completely changed the way we thought about the TM chassis. MXA’s Johnny Jelderda holeshot the second Pro moto at the 2017 World Two-Stroke Championship on MXA’s TM MX300 project bike against 36 other 250s, 300s and 500s. On the rough Glen Helen track, you could lighten up your grip and let the forks do the work. It saved energy and built confidence. The initial part of the stroke was plush and ramped up gradually for good bottoming resistance. The shock followed the forks well and had good absorption over rough chop. If it weren’t for the high rear end, we would have thought we were riding a high-dollar, built-up Japanese bike. It was impressive—and not just for a TM. These GPM Performance Kayaba forks were as good or better than Yamaha’s SSS forks. They were impressive. GPM is a German company. Ralf cracked the American code for TM, as well as the piggy bank. The TM MX300 runs a cool grand over the KTM 250SX at $8895 (not including the bells and whistles). Think of the TM as the Ducati of motocross bikes. You pay a little extra to get something only a few have.